A luxury bus rammed into a tractor trailer laden with sugar cane at around 6 AM near Bhutramatti on NH 4, in which the cleaner of the bus died on the spot and three others were injured. The Bus head from Bengaluru to Pune hit the the trailer which was laden with sugarcane. The tractor filled fuel and was trying to come back on the highway when the accident occurred. 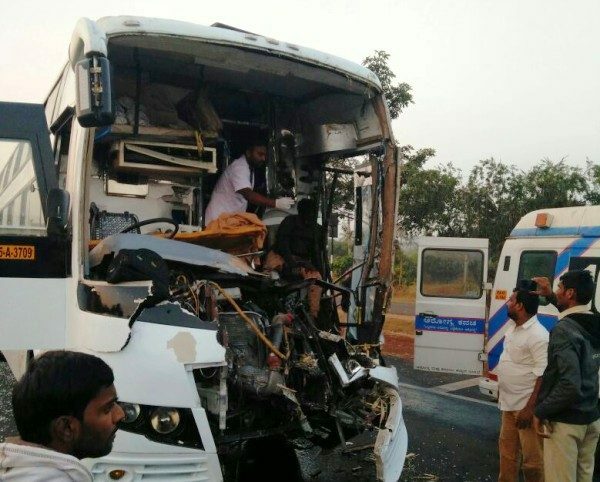 The deceased has been identified as Sidharamu Rajjna of Mandya while the two drivers were also injured. No Tractor has Tail Lamp / Reflectors on its Trolleys, which is a must for Safe standards. Simple they think by having Lights/Reflectors of the main Engine part is Enough. But they dont know the result of this, neither the RTO authorities who Inspect these Vehicles follow the Rules. I Myself have experience this, for any running vehicle(with their average speed) its difficult to control when it notices all of a sudden a Trolley with no lights or reflection neither any signal. The TRACTOR Owners / Drivers must be educated of this. Literally near the board stating accident-prone zone. Tractor drivers loaded with the cane can barely see anything behind or sideways. The bus driver should have been alert. Having said that some of the worst drivers on road are tractor operators.